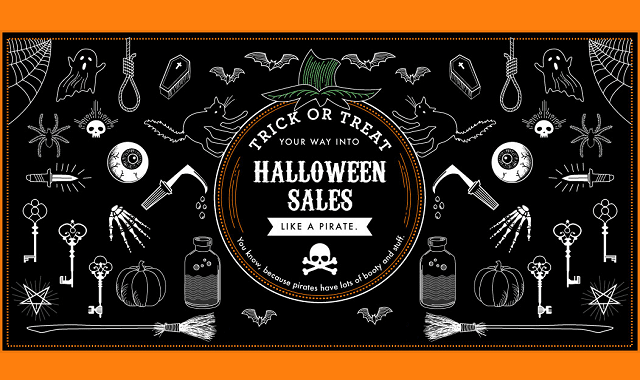 Trick Or Treat Your Way Into Halloween Sales #Infographic ~ Visualistan '+g+"
Whether you love or hate Halloween, it can’t be ignored! Especially since consumers are going to be forking out $8.4 billion this year on costumes, candy and decorations. You would think with over 45% of purchases happening at discount stores that we would be spending less than last year, but nope, we topped that by spending an additional $1.5 billion. Where are people getting their ideas for where to spend their $8.4 billion? Trends have to start somewhere. Influencers on Pinterest and social media in general are having a major impact on how people are celebrating this holiday. Currently 40% of people say their decision to buy a Halloween related item was directly impacted by influencers on social media channels like Instagram, Vine, and Twitter. This year plan to look out your window and see lots more freaky skeletons, various superheroes, and princesses roaming the streets. And of course we can’t forget our furry canine friends, who will most frequently be dressed like hotdogs and Yoda! Regardless of how Americans are planning to dress and spend, if you are blood thirsty like a zombie for some scary-good content, go ahead and check out this infographic by The Shelf for a sweet Halloween trick-or-treat breakdown.